Slickrock is a term which describes smooth, wind-polished sandstone. Contrary to its name, slickrock is not slippery or ‘slick’ at all. The graininess of the sandstone is much like sandpaper and is great for biking. Slickrock mountain biking is unique because it can only be found in the desert southwest. Although made famous in Moab, Utah, you can have the same experience without the crowds in southern Utah. 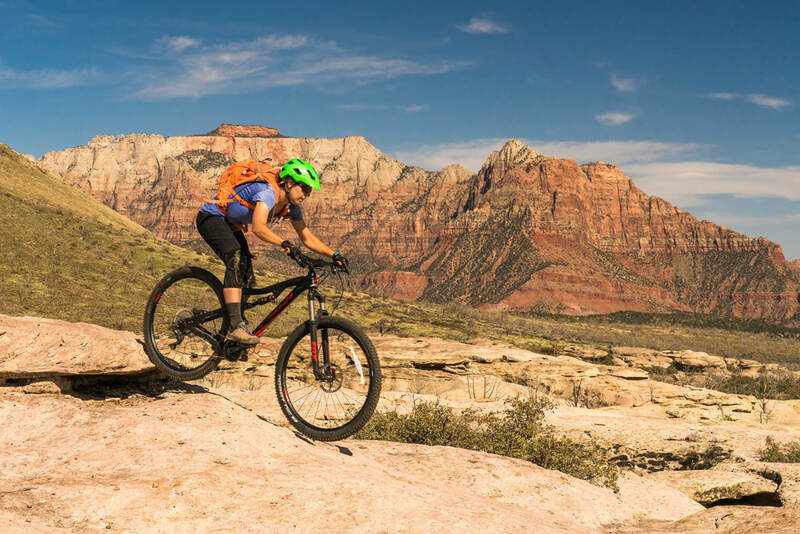 With Zion National Park providing a dramatic backdrop, your half or full day will explore the fantastic network of trails on Gooseberry Mesa. Designed primarily for experienced riders, your guide will demonstrate and teach you the specific techniques needed for slickrock riding, and will challenge you to put these skills to the test as you pedal through obstacles along the trail. Trips return between 3:30 and 5:30 p.m.
through August. Check your calendar and book early. We enjoyed our guides laid back style and he also was flexible on the trip, allowing us to ride and develop skills on different terrain...The slickrock setting up on the mesa was so picturesque and an all out awesome afternoon. 5 stars for our guide and Zion Adventure Company."